A 9-flip is a number that when multiplied by 9 has its digits reversed (e.g. ). This Demonstration shows and counts all 9-flips for numbers with 1 to 30 digits. 9-flips with an even number of digits can be divided into two types: straddlers (shown in red and dark red) and non-straddlers (shown in blue and dark blue). 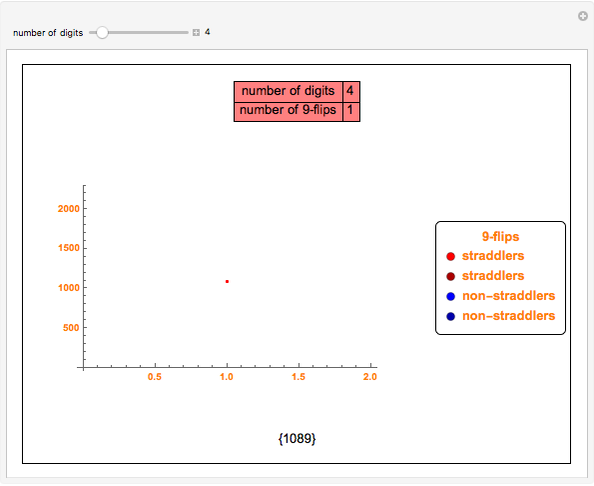 Straddlers have a central block in the middle that is a 9-flip (e.g. is in the middle of and ), while non-straddlers can be split into two 9-flips (e.g. ). The number of 9-flips with an even number of digits ( ) (as well as those with an odd number of digits) forms a Fibonacci sequence and obeys the recurrence relation . The code used to generate the 9-flips was built on the solution suggested in Exercise 55 of , p. 115. A straddler with digits can be obtained from a non-straddler with digits by inserting 1089 as a central block (shown in red) or by inserting 99 in the center of a straddler with digits (shown darker red). A non-straddler with digits can be obtained from a non-straddler with digits by inserting 00 as a central block (shown in blue) or by inserting 8910 in the center of a straddler with digits (shown darker blue). A 9-flip with an odd number of digits ( ) can be obtained from a straddler with digits by inserting a 9 in the center (shown red or darker red) or from a non-straddler with digits by inserting a 0 in the center (shown blue or darker blue). Hence the number of 9-flips with an odd number of digits ( ) is equal to the number of 9-flips with an even number of digits ( ), and this sequence of numbers of 9-flips with an odd number of digits ( ) is also a Fibonacci sequence obeying the recurrence relation . Snapshot 1: the first nonzero 9-flip is 1089 (a straddler), with four digits. 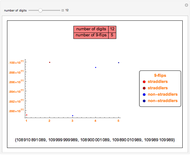 Snapshot 2: with five digits, the only 9-flip is 10989 (a straddler), obtained by inserting a 9 in the center of the four-digit flip. Snapshot 3: with eight digits, there are two 9-flips, a straddler ( ) and a non-straddler ( ) that can be split into two halves. Snapshot 4: with 30 digits, there are 377 9-flips, consisting of a mixture of straddlers and non-straddlers. A. Gardiner, Discovering Mathematics: The Art of Investigation, Mineola, NY: Dover Publications, 2006 pp. 63–118.